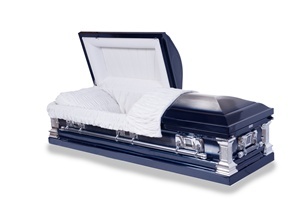 Our wood caskets are always created from solid wood and are never made of wood veneer. 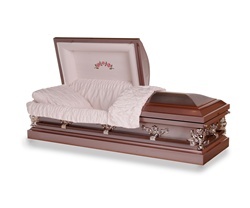 When you buy caskets online from Fast Caskets, you can choose from a variety of beautifully finished woods such as mahogany, cedar, cherry, oak, ash, walnut, poplar, and pine, which can be customized to be the style of your choice. Our casket styles range from artfully traditional to the more sleekly modern. Interiors are covered in plush velvet or soft crepe, and we invite you to personalize the interior with embroidered panels that reflect the unique qualities of your loved one’s personality and interests. We also offer a selection of elegant metal caskets in 18-gauge or 20-gauge steel, stainless steel, copper, or brass. Exterior finishes can be colored to your specifications. An 18-gauge steel casket will be somewhat lighter to carry than a 20-gauge casket, though the 20-gauge casket will be slightly sturdier. 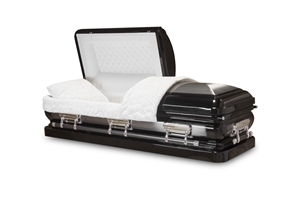 Our funeral coffins and caskets come in standard and oversized and are backed with a warranty. Please feel free to browse our selection and contact us with any questions.